Keuka Lake is the odd duck of the 11 Finger Lakes, having a distinctive Y shape. Because of this, the lake has two inlets--Cold Brook at the southern end of the lake and Sugar/Guyanoga Creek at the northern end of the left branch. The water of the left branch flows south around Bluff Point and into the right branch where all the water exits through the Outlet into Seneca Lake. This makes Keuka Lake the only lake in the world that runs in both a northerly and a southerly direction. In addition, because the Keuka Lake Outlet empties into Seneca Lake, it is the only one of the Finger Lakes that empties into another lake. However, these unique physical features only add to the charm of the lake. Locally, the lake is called the "crooked" lake. But there is considerable discrepancy as to what the Indians called it. Keuka is thought to mean "canoe landing" in Iroquois, but others claim it means "bent elbow." The Seneca Indians, who originally lived along the lake, are said to have called it O-go-ya-ga or "the promontory." This is thought to refer to what is now called Bluff Point, a 700-ft./213.3-m. high scenic overlook where the lake splits in two. 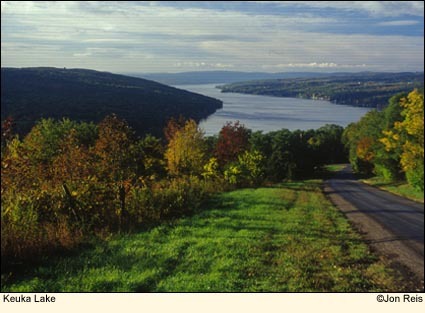 Keuka Lake is 19.6 mi./31.5 km. long and is the third largest of the Finger Lakes. Hammondsport was also the home of Glenn Hammond Curtiss, whose mother named him for the region and his home town. An extraordinary inventor, Curtiss is considered the father of American naval aviation. He was actually the first licensed pilot in the country. Curtiss is known to have flown his planes in the winter from the ice on the lake. His many exploits and accomplishments are on display at the Glenn H. Curtiss Museum on State Route 54. Hammondsport is the site of Genundowa, a Seneca Indian celebration of lights on the lake to give thanks for the peaceful times and the beauty and abundance of the region. The celebration has become a huge two-day event throughout the weekend before Labor Day (the first Monday in September), an event you won't want to miss. At the northern end of the lake is the Village of Penn Yan in Yates County. It is here that the lake's water exits via an 8-mi./13.8-km. long outlet on its way to Seneca Lake. The drop along the outlet is about 270 ft./82.2 m. with a number of waterfalls, making it an ideal location for the many mills that sprang up along it. 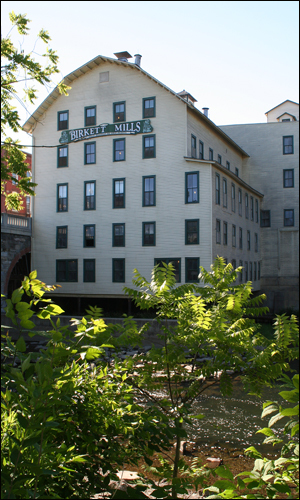 Most of the mills ceased to exist many years ago, but Birkett Mills still processes buckwheat, much of it grown in Yates and surrounding counties. It is the oldest operating mill of any kind in the country, having been built in 1796-97. The three-cornered seed of an annual plant (Fagopyrum esculentum) native to the Himalayas, buckwheat is technically a fruit. It is extremely healthful and gluten free. Four years after the Crooked Lake Canal opened, the steamboat Keuka began hauling passengers and produce on the lake. Steamboats continued to ply the lake for many decades and contributed to the growth in the number of cottages along the lakeshore. Today, like many of the other Finger Lakes, Keuka Lake's shoreline is crowded with homes, making access to the lake difficult. Despite this, spectacular views of the lake can be had from many points. The terrace at Esperanza provides an excellent view, and there is a parking area on State Route 54A below the mansion. 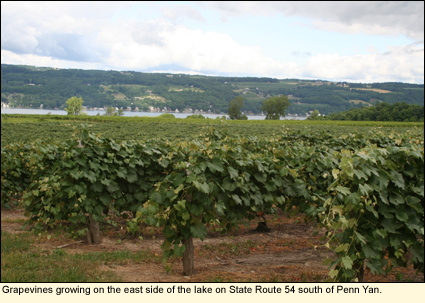 Some of the wineries also overlook the lake, and there is a state park that provides direct access, as well as two smaller boat launch sites and two village parks. 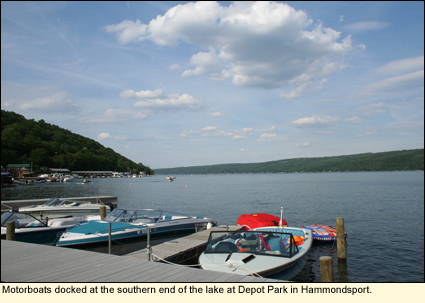 The lake serves as a water supply to Hammondsport, Branchport, Penn Yan, and Keuka College, which borders the lake. The water is relatively clean and clear. Eurasian milfoil has been introduced into the lake as it has been in many of the other Finger Lakes. The lake has a wide variety of fish species, many of them introduced as well. 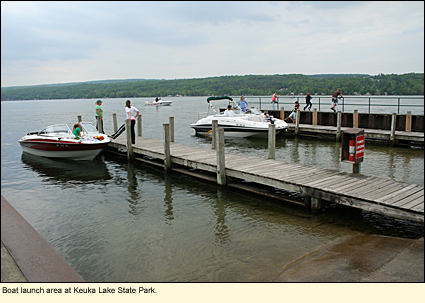 Keuka Lake has less wind that some of the larger lakes and, consequently, is more popular with motorboaters than sailboaters. Since all of the Finger Lakes Region is part of the Atlantic Flyway, Keuka Lake gets its share of migrating waterfowl and passerines. Flight north begins in early March, flight south begins in August. Much of the wooded land around the lake has been preserved and provides home to many year-round resident birds like turkeys, grouse, several species of woodpecks and owls, nuthatches, crows, ravens, blue jays, and chickadees. Rabbits, foxes, coyotes, and, on rare occasions, a black bear or two can also be found in the region. Boat dock, supervised swimming area, grassy picnic area. The park has 150 tent and trailer sites, a swimming beach, picnic shelter, boat launch ramp, docking space, and hiking trails. Cross-country skiing in the winter. The park is open year round. Camping from the beginning of May through the end of October. Off State Route 54A on Old Pines Trail Rd. This is a village park with picnic facilities and shade trees. This is another village-operated lakefront park just south of the village. Launches into Guyanoga Creek about 250 yds./228.6 m. north of the lake. Gravel ramp and parking for 4 vehicles. Brochure. Multiple hard surface ramps, docks, parking for 120 vehicles. Brochure.